Epipogium aphyllum (Schmidt) Swartz, Summa Vegetabilium Scandinaviae Systematice Coordinatorum. Holmiae [Stockholm] 32. 1814. - A perennial plant without chlorophyle. 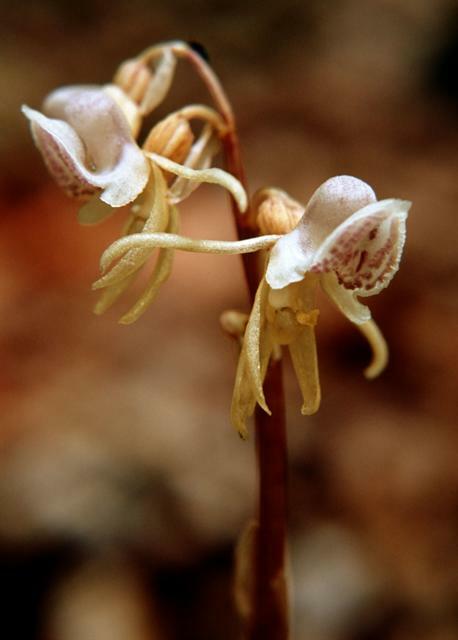 Flowering stems are not produced every year, and the plant can live underground for decades. The thick coralloid rhizomes are densely colonized by fungi - mostly Inocybe species, but the plant is also producing thin stolons up to 0,5 m for vegetative propagation. Stem light brownish to reddish, 5-20 cm tall, leafless but with 2-3 brownish sheats above the more or less swollen base. Inflorescence rather loose, with 1-7 flowers, most often there are 3-4. Bracts oblong, thin. Sepals linear, petals broader. Labellum 12-18 mm long, cream with papillose, purple spots, spur 5-8 mm long, 3-5 mm in diameter, obtuse. Epichile and spur both facing upwards. - In Denmark protected and very rare and today probably only in one or two locations.